Welcome to the APA Member-Initiated Task Force to Reconcile Policies Related to Psychologists' Involvement in National Security Settings Webpage! violation of human rights and appeals for tolerance." 1.02 Conflicts Between Ethics and Law, Regulations, or Other Governing Legal Authority If psychologists' ethical responsibilities conflict with law, regulations, or other governing legal authority, psychologists clarify the nature of the conflict, make known their commitment to the Ethics Code, and take reasonable steps to resolve the conflict consistent with the General Principles and Ethical Standards of the Ethics Code. Under no circumstances may this standard be used to justify or defend violating human rights. 1.03 Conflicts Between Ethics and Organizational Demands If the demands of an organization with which psychologists are affiliated or for whom they are working are in conflict with this Ethics Code, psychologists clarify the nature of the conflict, make known their commitment to the Ethics Code, and take reasonable steps to resolve the conflict consistent with the General Principles and Ethical Standards of the Ethics Code. Under no circumstances may this standard be used to justify or defend violating human rights. 2008 APA Amendment to the Reaffirmation of the American Psychological Association Position Against Torture and Other Cruel, Inhuman, or Degrading Treatment or Punishment and Its Application to Individuals Defined in the United States Code as "Enemy Combatants"
2007 APA Reaffirmation of the American Psychological Association Position Against Torture and Other Cruel, Inhuman, or Degrading Treatment or Punishment and Its Application to Individuals Defined in the United States Code as "Enemy Combatants"
This consolidated policy will replace the PENS report, along with other Council resolutions focused on national security settings, but will not replace the broader 2006 Council Resolution Against Torture and Other Cruel, Inhuman, and Degrading Treatment or Punishment, the membership petition resolution, or the amendments to the Ethics Code, all of which will remain intact as APA policy. There has been significant work on policy related to the role of psychologists in national security since the drafting of the 1986 Oppositions to Torture Resolution, the 1987 Human Rights Resolution, and the 2005 PENS report. 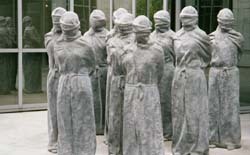 These newer policies are more extensive in their clear prohibition against psychologist involvement in any form of torture or cruel, inhuman, or degrading treatment or punishment as defined under international law and hence, these policies must be moved into the forefront of all general policy concerning the role of psychologists in interrogation settings. PENS now also contradicts more recent policy, including the Ethics Code, and should no longer be referenced as current APA policy. Links to all APA policy documents can be found on our Links page.